CORONADO — Home to the second largest concentration of enlisted service men and women in the country and nearly 16,000 teens of active duty military families, Outdoor Outreach and Coronado Yacht Club partnered together in 2014 to unite military families through recreational boating. 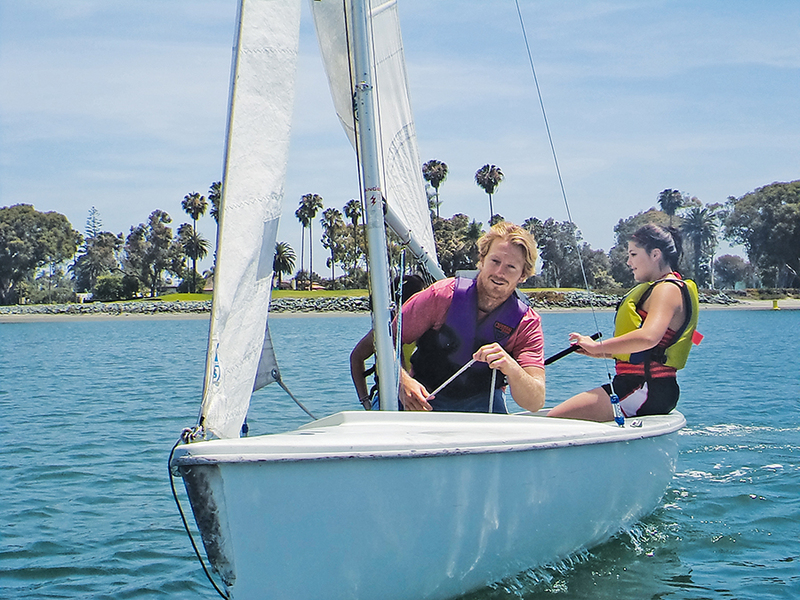 Outdoor Outreach plans to continue supporting San Diego’s active duty military families with teenagers by providing free ongoing recreation activities, including sailing. Each summer, Outdoor Outreach runs upwards of 50 water sport trips in Coronado, including sail, surf, standup paddleboard and kayak activities. According to Outdoor Outreach Executive Director Ben McCue, teenagers are recruited into the program through the various formal and informal networks for San Diego’s military families. Through the program, they have the opportunity to connect with other teens from similar backgrounds and learn skills to help with the everyday challenges of growing up in a military family. The Coronado Yacht Club (CYC) partnered with Outdoor Outreach by hosting 21 military teens for a day of sailing and standup paddleboard lessons back in June 2014. Participants had an hour-long lesson on land before boarding two-person FJ dinghies to sail in Glorietta Bay. The sailing lessons were a part of the Coronado Yacht Club’s work to give back to the military community and engage youth in sailing who otherwise would not have these opportunities. “CYC was excited to provide this opportunity for youth from military families. Learning to sail can be challenging – we were all impressed by how quickly the group took to the water,” said Becky Nygren, director of Jr. Sailing. Parents, like Navy seaman Christopher Okimura, were grateful for the experience. “My kids had a blast at the Coronado Yacht Club … (and) they continue to make lifelong friendships and memories through Outdoor Outreach’s outstanding programs,” Okimura said. “Now he is much more comfortable socially and is doing better in school. I give a lot of credit for this to the experiences and friends he made through the program,” she said. McCue added the outings are more than just getting out on the water. “Introducing them to positive outdoor experiences and a supportive peer network is a great way to help teens build resiliency and cope with challenges in their lives. Recreational sailing is an amazing experience for them. They learn teamwork, respect, trust and responsibility, while having a really great time,” McCue said. In the past year, Outdoor Outreach’s military program provided more than 20 outings for more than 150 individual youth. The program was made possible by generous contributions from individuals and local businesses as well as funding from Rose Foundation and Sierra Club Foundation. “Having grown up by the water, it’s fulfilling to share these experiences with kids who wouldn’t otherwise have the opportunity,” Scott Shepherd, a graduate of Coronado High School and full-time youth development programs manager with Outdoor Outreach, said. Outdoor Outreach is looking to lead three more half- and whole-day youth sailing outings in January for 10-14 youth each. The organization is also looking for funding partners to support a more intensive spring and summer sailing program for military youth. To learn more about Outdoor Outreach and how you can support their efforts, call them at (619) 238-5790, visit their website http://www.outdooroutreach.org/ , or email info@outdooroutreach.org.